Mario Beetle - win this at GAME next month! It’s fair to say that April 2008 is going to go down in the annals as a vintage month for gaming, with Mario Kart Wii and GTA IV both at the top of our current wish-list. 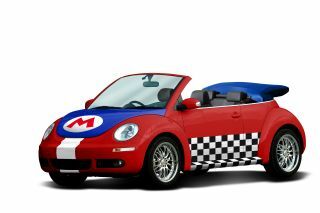 And by way of celebration, Nintendo is giving away the VW Beetle Convertible you can see right here, sporting a bespoke Mario Kart paint job. “To celebrate the launch of Mario Kart Wii, Nintendo and Game are challenging the nation to take part in the Mario Kart Grand Wii, a tournament set to find the country’s best Mario Kart driver. Keen drivers will be first off the grid, trialling the new game before it goes on sale anywhere in the world and could win themselves their own Mario Kart VW Beetle Convertible,” said Nintendo. You can play the game a week before the official launch on Saturday 5 April at selected Game stores, with the ‘Grand Wii’ final taking place at an exclusive racing day event at Mercedes-Benz World, Brooklands, Surrey on the 12 April. The GTA IV and Mario Kart cliques are already beginning to form in the TechRadar office. For more on your nearest Game store that is hosting the Mario Kart challenge on Saturday 5 April, head to Game's website.